I am excited that we are finally getting fruit from our 2 Che bushes. We planted these plants 2 years ago. 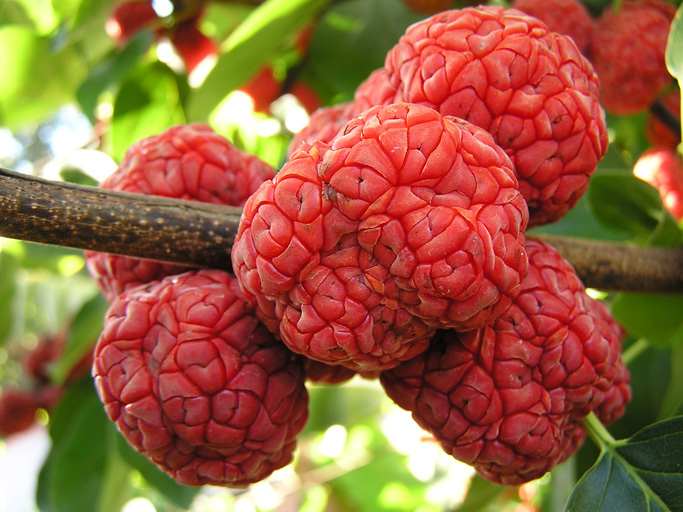 The fruit in the photograph above are immature, and they will ripen into a reddish, maroon fruit. Here is a link to a great photo of mature fruit - photo. I first read about the Che in Lee Reich's book Uncommon Fruit for Every Garden, which is a great resource if you have not read it. Reich describes the fruit taste as a combination of fresh fig and mulberry, but not as rich as fig or as sweet as the mulberry. When I was looking for my plants, I did not find many mail-order nurseries that carried the Che. I purchased mine from Edible Landscaping. This nursery grafts the tree onto Osage orange to prevent suckering. Here is how Edible Landscaping describes the tree and fruit: "Bears splendid crop of lovely red fruit clusters over the entire tree. A center of attention at ripening time. Fully ripe fruits are juicy, sweet, very pleasant and fig-like in taste. Birds don't bother the fruits. Completely seedless and self fertile, does not need a male pollinator. Makes great "fig" preserves. Space 14' circle . . . Che on its own roots can sucker . . . Che in China are also called the 'Silkworm tree'. Like the mulberry Che's leaves are the primary food for silkworm . . . Che trees are rounded small trees probably 25' high and the same width if left to grow for about 30 years . . . Placement of the tree should be in the open or along side of small trees like Filberts or Apples . . . they ripen in late September or October. We have noticed fruit on the male too . . . It seems the male only sets sparsely if at all." There has been some online discussion as to whether the che, in fact, needs a male pollinator. While there has been some disagreement, the general consensus is that you do not need a pollinator. In planting a young Che, however, you need to make sure you are planting a female plant - not a male. My plants have a bush-like form and do not want to grow straight up with a leader. Rather, they want to produce arching branches. The branches have very large 2 inch thorns, but the thorns are not prolific and can be navigated around without impaling yourself. The fruit seem to grow at the base of new branch or leaf growth -- in the axils of leaves on growing shoots. I have crammed my two plants into a small area that is approximately 10 feet by 6 feet. The space is in partial shade, so we will see how that affects fruit production. I would not mind growing these plants in a bush-like shape because I have other fruit trees growing behind them. Here are few sites/posts with additional information on the che: California Rare Fruit Growers; NAFEX post.